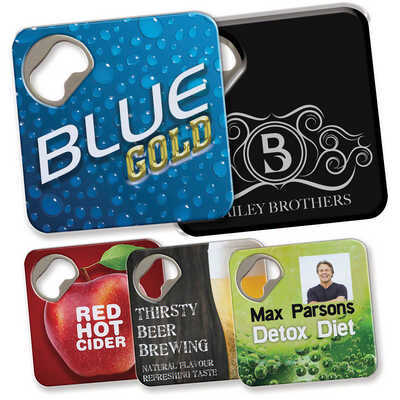 Combination bottle opener and coaster with EVA foam on back. Nickle plated steel bottle opener for opening bottles. Great full cover print area. Colours - Black, White Size - 82 x 82 x 4mm (LxHxD) Decoration Area(s) - Pad Print : 40 x 40mm (LxH); 4CP Digital Direct : Full coverage - 82 x 82mm (LxH), 3mm of bleed required for all Full Reversal artwork. Price includes : 1 Col 1 Pos Print. Setup is included.